What's waiting for you in Blanes? Blanes: during daytime, a wonderful place full of relaxing and cultural experiences for the whole family. And in the night-time, a paradise of clubs, pubs and terraces. Stay in a private villa or in an apartment in Blanes and you'll be one step closer to launch into a city trip to Barcelona. Would you rather do your own thing and have more privacy? Then Blanes is also your ideal holiday resort in Spain. For many years, Blanes has been one of the favourite holiday destinations on the Costa Brava. Its authorities and, of course, its local population will welcome you, and the rest of the holidaymakers, with their finest side. Nature and family are especially valued in Spain, so everyone will be able to enjoy all types of activities, accommodations and services. And what about the nature lovers that would like to enjoy Blanes and its surroundings? They'll find splendidly protected and preserved fauna and flora. Blanes is known for fun and amusement, which you can both find in the old village centre and in the new touristic area. Moreover, the touristic and the historical areas are communicated with each other and at close range. So you can easily switch between both worlds! At the bottom of the hill, Blanes' harbour and, on the top of the hill, the botanical garden and the ruins of the Sant Joan castle. You arrive on Saturday, discover your villa, unpack your suitcase, pay your first visit to the supermarket and, finally, you splash into your private swimming pool. Sunday starts with a homemade breakfast while you languidly wake up on your terrace. Later on, you discover your new neighbourhood and you go to the nearest beach. And then it's Monday. On Monday, the week starts and all the range of possible activities in Blanes are waiting for you. You begin the morning with a visit to the weekly local market, around the harbour of Blanes. You'll find fresh food in the fruit and vegetables market, which's located just behind the weekly one (Passeig de Dintre). On Spanish time you'll be ready for lunch. Take a freshly baked baguette, delicious cheese or cold meat and a juicy melon; slow down and relax on the beach. Gaze at the sea and delight in your kids playing peacefully. Or float on the waves and feel free! Temperatures in the summer period are very pleasant and will incite you to a tasty ice-cream or a plunge into the water to refresh. While the sun slowly goes down, the evening approaches. So it's time to collect your beach stuff and return to your holiday home. After everyone's refreshed and dressed up, the big question rises: cooking at home or choosing between one of the restaurants in the old city centre or a bistro in the touristic area of Blanes? When it comes to places to eat, Blanes is very well represented. In the old fisher's area, you can find a boulevard with a big choice of fish restaurants. You can choose between having an after-dinner chat; a relaxing walk on the sea-side boulevard, where you can also discover the colourful night market (with jewellery, art and other cute souvenirs); or maybe a stroll around the harbour. Afterwards, the nightlife starts. The musical aura in Blanes will make you dance until the morning light. Today's gone, and what about tomorrow? It's still a mystery because of the several options, what do you think about: a day in Barcelona, go karting or a boat trip to Lloret de Mar, Malgrat de Mar, Santa Susanna or Calella. Not to mention that there is so much more. Come and try it yourself and discover more about Blanes and its fascinating surroundings. Spoil yourself and stay in a holiday villa where you will be the king of your own kingdom or book an apartment on a short walking distance to the beach of Blanes. Which basic ingredients do you need to experience an ultimate holiday? Maybe the sun rays that provide you a pleasant temperature of 28 degrees and the beach that is less than one hour away with your car? Thanks to its situation Blanes enjoys the Mediterranean climate. In the summer period, the sun shines regularly and makes the average temperatures remain between the 16 and 28 degrees. Blanes receives very little rainfall. The greater concentrations of raindrops particularly take place in spring or autumn. And during the winter? You can barely notice them. In other words, you can usually land on one of the beaches in Blanes. - Cala Sant Francesc, which's a white sand beach that has received the blue flag title and is situated on the north-east of the Turó de Sant Joan and Blanes' harbour. - Playa de Sa Boadella, which has coarse sand and is also a nudist beach. - Playa de Blanes is the beach nearby the harbour and on the north of the outstanding rock "Sa Palomera". It has coarse sand, which slopes gradually into the sea, and it's the place of departure from the regularly scheduled tour boats. During the summer, you can find lifeguards as well. 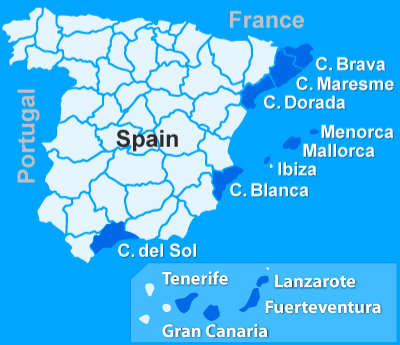 - Playa de S'Abanell is the longest beach of all. It has coarse sand and, during the summer, it has lifeguards and parasols and sun loungers for rent. Before you can spread your towel on the sand, you walk or drive with your (rented) car to the beach. Would you rather do something different? Feel the wind blowing on your back in one of the touristic boat trips to the beaches of Sant Francesc, Santa Cristina or Sa Boadella. Spain protects its nature and preserves its cultural heritage. But, at the same time, the right to exist of fishermen is also guaranteed. Day after day, boats arrive at the harbour between four and five p.m. with an overloaded charge of fish. After that, you can closely follow the atmosphere of the fish auction and taste the fish in its restaurant or in the local fish dealer. Or buy an appetizing fish on the market to prepare yourself on the barbecue, in the oven or on the stove. The harbour is near Plaça Catalunya, where you will be able to take the blue/yellow touristic train (only in the summer period). This cosy train departs from the end of the boulevard and Marià Fortuny's corner and brings you to the entrance of the Marimurtra botanical garden. This is for those who prefer some extra facilities or are disabled, because another option is to follow the stairs that are at the end of Marià Fortuny. Marimurtra is considered by many visitors as one of the most beautiful botanical gardens, thanks to the German businessman, Karl Faust, who designed it. Once you reach the top of the hill, you'll be delighted by the colourful and impressing amount of tropical plants and peculiar trees. While you walk to the coast through the beautifully designed pavilions you'll be rewarded with an amazing view. Nevertheless, it's worth the climb or the ride. Another interesting botanical garden is Pinya de Rosa, where there's a unique landscape view from the steep cliffs of Blanes. Besides, you will admire the garden architecture and art from the countless footpaths and stone steps. And, actually, when they designed these gardens they also thought about families with small children as there are swings, playgrounds and benches to eat or drink something or simply to have a rest. From the top of the hill, you descend to the old village centre of Blanes. Or you do just the opposite thing and you climb further till the Romanic defence tower, la Torre de Sant Joan, which used to be part of the Castillo Forcadell of Blanes. The blue/yellow touristic train also stops there and in other high lights from Blanes. So you can just sit and enjoy the view! Do you feel like stretching your legs? Then it's sure a good idea to have a walk through the narrow alleys in the old centre. You'll pass by Carrer Nou, Carrer Raval and Carrer Maria and you will enjoy their stately mansions. Finally, you'll gaze at the fabulous front of the parochial church of Santa Maria. Many visitors like to know more about the region where they rented their villa. Blanes and its surroundings will certainly invite you to discover their most interesting places. Where could you go with your family and friends? - Maybe shopping or discovering more authentic and important architectural high lights? Also Camp Nou is worth to mention on the list. Fortunately, there is regularly a train that departs from Blanes to Barcelona or Girona. The easiest way to get to the train station is by bus (direction Blanes Estació). - Pure nature as much as you want. On the way to the Parc Natural del Montseny, at the mountain range Sierra del Montseny, you will pass through many traditional villages like Viladrau or Santa Fe del Montseny. Once you arrive, you can have a walk and eat a tasty meal. - Fast, faster, the fastest. Are you always the first one to pass the finish line? Test your driving skills on the kart track of Blanes! - Do you never get bored of slides? Come to Water World, one of Europe's biggest water parks and you will have more fun than ever. Are you more adventurous and daring? Show your courage and try the bungee jump from 100 metres high. - There is no age for a refreshing swim. Marineland mixes lots of fun with passion for animals. A day trip to Marineland is ideal with the youngest of the family. There are many swimming pools and slides which, of course, are watched by lifeguards. You will find scheduled animal shows and during the pauses you will have time to walk through the installations where the animals live. Don't forget your camera to take nice pictures! See the mainland from another side. From the water, everything looks different and you discover new places to visit later on. Some of the water sports you can practise are jet skiing, sailing, parasailing or diving. Or maybe going all together on the banana or the fly fish. The wakeboard is also waiting for you! Would you rather enjoy a relaxed day on the water? The catamaran cruise is also another option in the summer period. If you prefer an activity that does not involve water, you can always hire a bicycle or a mountain bike and go off-road. Because of the Spanish roads not being completely well suited for cyclists, if you have kids, we recommend you to use only the cycle paths. Blanes' weekly market starts on Monday morning around 8:30 in the old village centre, near the boulevard. At 14:00, the merchants start to pack up their merchandise. Would you like to eat fresh fruit and vegetables every day? That's possible thanks to the daily market at the Passeig de Dintre (on the parallel street from the boulevard). You can also visit the fish auction when the fishermen come back between 16:00 and 17:00 every day and buy there in the fish market. Though you will probably do the biggest food purchases at the local supermarkets: LIDL, Aldi or Mercadona. These are situated at the GI-682, the major road from Lloret to Blanes, at the roundabout from Burger King and Mc Donalds. "Seek and you shall find". Clothes, accessories and shoes, you will find all these in the major street of the old village centre of Blanes. Do you need some extra space in your suitcase because of all the new things you have bought? In cities like Barcelona or Girona you will find even more shops. Besides these, you can also visit some of the big shopping centres, like Mataró Park, Espai Gironès or la Roca Village. In Blanes you can find plenty of tearooms and bars, where you can have a drink during the day and the early evening. Perhaps this is different in your home town, but in Blanes, even in the winter, everyone stays out until late. This added value gives to Blanes an extra summer touch. In the neighbourhood "Los Pinos" (the modern touristic area), you can loosen up your hips to the swinging rhythms of salsa, reggaeton or house music. The most famous clubs are Arena, Sala Vega and Sunset. Do you want more variation? That is possible. Just a few kilometres to the north you will find Lloret de Mar. More pubs, bars or terraces (opened till three o'clock) and a multitude of clubs are waiting for you there. Liberty above all things", is what people say. And of course, this is true. When you travel with your own car, a rented one or a scooter, you are not tied to time schedules and you can stop where and whenever you want. Just take account of the traffic, which is probably a bit different of your home country. To rent a car you require a driving licence and a passport or ID card. In most of the rental car companies a minimum age and a minimum amount of years in possession of the driving licence are demanded. You will also need a credit card to pay the deposit. Easy does it: A trip by train from Blanes to Barcelona is impressive by itself, because of the rails being just next to the coast. And the accessibility to the intermediate coastal towns is unlimited, thanks to the several train stops. In Blanes, you can also take one of the regular buses to towns like Lloret de Mar or Barcelona. You will find the up-to-date departure times and stops of the train on the RENFE website. For information about the local bus, you can check the Pujol website. And for your bus trip to Barcelona the Barcelona Bus website. Obviously, you can also get this info at the Tourism Office (Oficina de Turismo), at the bus station and at the train station of Blanes. The nearest airport is Girona (IATA: GRO; ICAO: LEGE), barely 35 km of Blanes. Barcelona's airport, el Prat de Llobregat (IATA: BCN; ICAO: LEBL), is located at more or less 88 km from Blanes. The Spanish calendar has many holidays. During the summer, you'll not notice too much because most companies do not close. What you'll notice are the local festivities. During the 3r or 4th week of July, Blanes is the indicated place. Make certain that you've a nice spot on the beach before 10 p.m., because at 8 in the evening the roads are cut off and the traffic is limited. Considering that the firework festival of Santa Anna attracts thousands of people, you should take your time when you return to your villa or apartment. If you're so lucky to be in that period in Blanes you can't miss this international event! So you noticed that Blanes, originally a fishing village, has numerous possibilities for you, your family and your friends. Either you stay in Blanes or if you prefer to discover the surroundings. To tell the truth, Blanes has on its own so many cultural treasures, nature and beautiful beaches, that it is unnecessary to search this outside. Though it is very tempting to do. Due to its strategic situation, Blanes is at short distance from everywhere. With a direct connection by train, you will reach the metropolis of Barcelona or the historical city of Girona. You can get to the neighbouring town, Lloret de Mar, or the water parks by bus. If you have a car you can also organise a trip to the inland. So in Blanes: "the sky is the limit". Look for you limit in a perfect holiday in Blanes. Club Villamar has a big offer of holiday villas, start from the beginning and choose a holiday home or apartment using the orange button on this page! Dream villa for the kids and the family with fenced pool, trampoline, playground ánd 2 living rooms and a completely furnished kitchen. Furthermore, the house offers 6 bedrooms and also 5 bathrooms. A very luxurious 8-person villa with private pool, multiple terraces and a great view over the beautiful bay of Blanes.